With the membership of our message board being so high, it’s easy to miss when a particular member suddenly stops posting. Some of these members move away, others get too busy with work and a few even give up fishing altogether. Whatever the case, they’ve decided to move on and we wish them the best. But once in a while, one of these members that we didn’t know left, will have stopped posting for another reason altogether. Kevin Woyjeck was one of these members and he gave his life while fighting the Yarnell fire in Arizona last year. I received the following email from Joe Woyjeck, a fire captain with the L. A. County Fire Department and Kevin’s father. “I’m the father of fallen Granite Mountain Hotshot Kevin Woyjeck, he was one of the 19 firefighters killed at the Yarnell fire on June 30,2013 in Arizona.” “Kevin was 21 years old, an avid fisherman, and a member of Bloody Decks. This kid was hooked on fishing from day one, from the time he could talk every body of water we passed on vacation would get the same question, “Dad, do you think there are fish in there?” Because of his passion for fishing, and his lack of a need for sleep, he worked as a pin head on numerous local sport boats; in between fire academies and deployments. As you can imagine the year since we lost our boy has been tough, incredibly tough at times. My wife has started a non-profit 501-c3 organization called the “Kevin Woyjeck Explorers for life Association“. 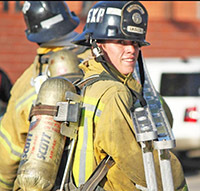 The organization is to help young men and women reach their goals of becoming a firefighter through donations of funds to support education and equipment. 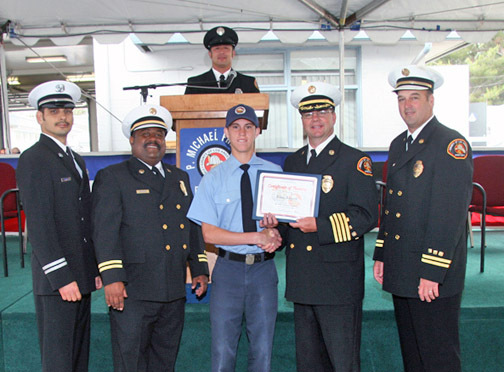 Kevin started as an explorer at 15 years old and the firefighters in the station helped shape him into the young man he was. September 5 would have been Kevin’s 23 birthday and I guarantee you he would have gone fishing, so we are celebrating his birthday by going fishing. 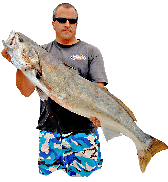 With the help of the owner of the sportboats, City of Long Beach and the Enterprise out of Marina Sportfishing in Long Beach, we will be having a charity fishing event on that date with 100% of the funds raised going into Kevin’s charity. If you live in LA or Orange County and can get that Friday off work, please come down and support this great cause. Even if you can’t, please help by donating a few dollars and let’s show some support for a young man who gave his life protecting the people of Yarnell, Arizona. Editors Note: Let’s show this fellow BD’er and his family some support as they give back to the community in memory of Kevin.